A Female Civil War Surgeon: "How Dr. Mary is Remarkable" | Doctor or Doctress? 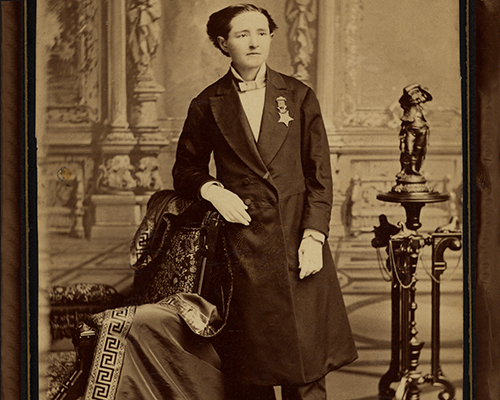 A Female Civil War Surgeon: "How Dr. Mary is Remarkable"
This story focuses on one individual, Dr. Mary Edwards Walker: Civil War surgeon, Medal of Honor recipient, and feminist reformer. The sources provide a window into the life of a woman who throughout her life continually challenged expectations set for women's dress, education, and work. Dr. Walker's story may be used to enhance a lesson on women in the Civil War or a unit on women reformers. It may also serve as an entry point for a discussion about school dress codes and other societal expectations that direct how women and girls should present themselves today. Use the letter to Lida Poynter from Elizabeth Stack and the letter to Dr. Mary Walker from Rosa Sprig to create a graphic organizer comparing the two letters' descriptions of Mary Walker. Have students use this to create a drawing of what a stranger might expect of Dr. Walker's physical appearance and behavior, if that stranger had only read one of the letters. Have students read the newspaper article “How Dr. Mary is Remarkable” and consider whether or not this was a positive depiction of Mary Walker. Ask students to underline or copy one negative quote about her, one positive quote, and one quote that they're not sure about. After reading the letter to Mrs. C.W.M Poynter from Brigadier General James F. McKinley, have students write a letter to the board of officers who cancelled her award. In the letter, students should react to the way they feel about the cancellation of Dr. Walker’s medal of honor, supporting their thoughts with evidence from the other available sources. Have students find a recent news story relating to gender bias in the workforce. They may use this to draw comparisons between Dr. Walker's experience and how women are treated today when it comes to doing certain jobs or participating in certain activities (sports, clubs, politics, etc.). Many schools have written rules on what students can and can't wear to class. Are school dress codes the modern-day equivalent of the strict social expectations around clothing during the Civil War era? Read the newspaper article "Dr. Mary Walker in Durham." How common was it for a woman to be participating in special services in the United States Army? How does this contrast to the amount of women in the military today? The way that Dr. Mary Walker dressed was very controversial at the time. What kind of standards are women today held to with how they dress? How are these standards similar to and different from those of Mary Walker's era? Many women agreed with Dr. Walker’s ideas, but were taken back by her personality and mannerisms. These feelings are evident in the letter to Dr. Mary Walker from Rosa Sprig. How does Dr. Walker's gender affect Sprig's comments? Is it possible that Sprig would have approached this differently if Dr. Walker was a man? Mary Walker’s Medal of Honor was reinstated by President Jimmy Carter in 1977. How does this reinstatement affect Mary Walker’s legacy and the way she is remembered today? "Eliminating Gender Stereotypes in Public School Dress Codes: The Necessity of Respecting Personal Preference." Natalie Smith. Journal of Law & Education 41 no. 1 (2012) 251-59. Accessed 2/1/2018. This article discusses the controversial issue of school dress codes from a legal point of view. Students may draw a number of parallels between the debate around dress reform in Dr. Walker's time and the debate around dress codes today. "Medal of Honor: History and Issues." David F. Burrelli and Barbara Salazar Torreon. Congressional Research Service. 5 September 2014. Accessed 2/1/2018. This article provides background on the history of the Congressional Medal of Honor, of which Dr. Walker is the nation's only female recipient. On page five, the article discusses Dr. Walker and provides some additional details regarding the circumstances of how her medal got revoked and reinstated. "Dress Reform" in Hit. Mary E. Walker, M.D. New York: American News Company, 1871. 58-84. Accessed via Women Working, 1800-1930. Harvard University Library Open Collections Program. In this second chapter in her book of essays, Dr. Walker discusses her views on society's expectations of women's dress and makes arguments for dress reform.